Today is Europe Day, marking the anniversary on 9th May 1950 of the Schuman Declaration which proposed the establishment of the European Coal and Steel Community (ECSC). By pooling the means of coal and steel production, French Foreign Minister Robert Schuman argued, another war in Europe would become an economic impossibility and a political improbability. And so the ECSC was established in 1951, with its founding members, France, the Federal Republic of Germany, Italy, the Netherlands, Belgium and Luxembourg. This then morphed into the European Economic Community, which very subtly became the European Community, which developed into the European Union, which is fast becoming the United States of Europe. It isn’t clear why remaining a member of an anti-democratic political union and being increasingly absorbed by its labyrinths of opacity and bureaucracy mitigates the possibility of war. Does having Switzerland or Norway outside the EU increase the likelihood of armed conflict? 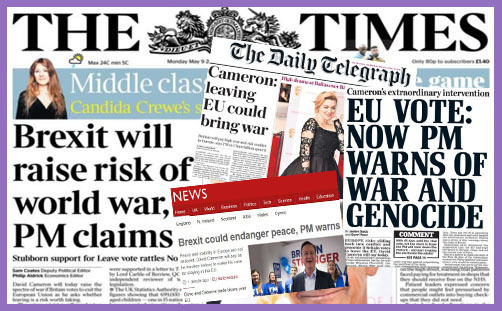 Why should Brexit lead to war or genocide? Some would argue that the EU’s very polity is the cause of social tensions which are far more likely to escalate into civil unrest, if not war. Look at Greece (Golden Dawn). Consider what is happening in Austria (Freedom Party), Germany (Alternative for Germany), France (National Front), Netherlands (Freedom Party), Italy (Northern League), Denmark (Danish People’s Party), and Hungary (Jobbik). These aren’t all trifling 4% fringe parties: some of them are attracting the support of more than 20% of the electorate. When people are coerced by a single currency and corralled by a common borders, there is a feeling of impotence and disenfranchisement; of a loss of identity, history, culture and tradition. No wonder the ‘populist’ parties of the nationalist ‘far right’ are on the ascendancy. You can’t buck the people. But the Prime Minister is persuaded that only by remaining in the EU can another war be averted. There is something a little unbalanced about this. Where is the historic perspective that the age of empire has passed? Where is the apprehension that the EU (28 states) is not Europe (c50 states)? Where is the judicious political discernment in the assertion that the fear of war justifies the emasculation of sovereignty and the abatement of democracy? David Cameron doesn’t appear to grasp that the European Union is the supranational beast which is the very cause of antagonism not just for millions of Britons, but for millions upon millions of Greeks, Italians, Germans, French, Danes, Dutch… It is easy to forget that some of these nations have voted time and again against EU treaties and the centralising direction of policy, only for their democratically-expressed wills to be set aside by the oligarchs of Brussels beholden to a dominant Germany. This, surely, is what Britain fought two world wars to prevent. While the European Parliament Information Office goes into overdrive for this glorious celebration of Europe Day, it is time to reflect seriously on the consequences of remaining. If we vote to stay in the EU, the sovereignty of the people will forever be subject to unaccountable, immovable, infallible, self-perpetuating Europhile elites. It will be no form of sovereignty at all. The existing common policies of agriculture, fisheries, transport, airspace, security, economy, energy, environment, justice and citizenship will extend incrementally to public health, education, taxation, civil protection and military union. There will be a United States of Europe ruled by a President of Europe. He or she will not need to solicit your vote. You will not be able to remove him or her from office. And God will not get a look in. Why should He? The Enlightenment Project of immutable human rights will have reached its zenith. What need the ancient sea of faith or the creeds and rituals of mythological Christendom? Have not these things been the historic cause of enmity and bloodshed? What need democracy? Has not this fomented resentment, division and sectarianism? Come to think of it, what need the people?